The earthing screen and ground wires can well protect the electrical system against direct lightning strokes but they fail to provide protection against travelling waves which may reach the terminal apparatus. The Lightning Arresters or surge diverters provide protection against such surges. A lightning arresters or a surge diverter is a protective device which conducts the high voltage surges on the power system to the ground. Fig. 24.8 (i) shows the basic form of a surge diverter. It consists of a spark gap in series with a non-linear resistor. One end of the diverter is connected to the terminal of the equipment to be protected and the other end is effectively grounded. The length of the gap is so set that normal line voltage is not enough to cause an arc across the gap but a dangerously high voltage will break down the air insulation and form an arc. The property of the non-linear resistance is that its resistance decreases as the voltage (or current) increases and vice-versa. 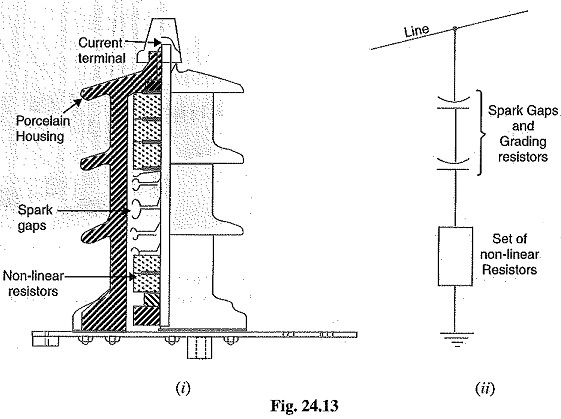 This is clear from the *volt/amp characteristic of the resistor shown in Fig. 24.8 (ii). Under normal operation, the lightning arresters is off the line i.e. it conducts no current to earth or the gap is non-conducting. On the occurrence of overvoltage, the air insulation across the gap breaks down and an arc is formed, providing a low resistance path for the surge to the ground. In this way, the excess charge on the line due to the surge is harmlessly conducted through the arrester to the ground instead of being sent back over the line. It is worthwhile to mention the function of non-linear resistor in the operation of arrester. As the gap sparks over due to overvoltage, the arc would be a short-circuit on the power system and may cause power-follow current in the arrester. Since the characteristic of the resistor is to offer high resistance to high voltage (or current), it prevents the effect of a short-circuit. After the surge is over, the resistor offers high resistance to make the gap non-conducting. Two things must be taken care of in the design of a lightning arresters. Firstly, when the surge is over, the arc in gap should cease. If the arc does not go out, the current would continue to flOw through the resistor and both resistor and gap may be destroyed. Secondly, I R drop (where I is the surge current) across the arrester when carrying surge current should not exceed the breakdown strength of the insulation of the equipment to be protected. 1. Rod Gap Arrester: It is a very simple Line type of diverter and consists of two 1.5 cm rods which are bent at tight angles with a gap inbetween as shown in Fig. 24.9. One rod is connected to the line circuit and the other rod is connected to earth. The distance between gap and insulator Transtormer distance P) must not be less than one-third of the gap length so that the arc may not reach the insulator and damage it. Generally, the gap length is so adjusted that breakdown should occur at 80% of spark- over voltage in order to avoid cascading of very steep wave fronts across the insulators. The string of insulators for an overhead line on the bushing of transformer has frequently a rod gap across it. Fig. 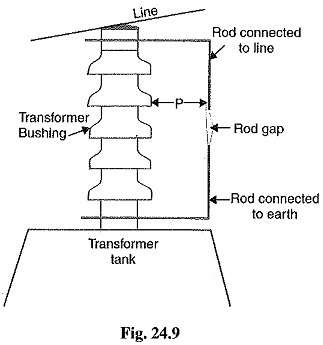 24.9 shows the rod gap across the bushing of a transformer. Under normal operating conditions, the gap remains non-conducting. On the occurrence of a high voltage surge on the line, the gap sparks over and the surge current is conducted to earth. In this way, excess charge on the line due to the surge is harmlessly conducted to earth. After the surge is over, the arc in the gap is maintained by the /normal supply voltage, leading to a short-circuit on the system. The rods may melt or get damaged due to excessive heat produced by the arc. The climatic conditions (e.g. rain, humidity, temperature etc.) affect the performance of rod gap arrester. The polarity of the surge also affects the performance of this arrester. Due to the above limitations, the rod gap arrester is only used as a tack-up’ protection in case of main arresters. 2. Horn Gap Arrester: Fig. 24.10 shows the horn gap arrester. It consists of two horn shaped metal rods A and B separated by a small air gap. The horns are so constructed that distance between them gradually increases towards the top as shown. The horns are mounted on porcelain insulators. One end of horn is connected to the line through a resistance R and choke coil L while the other end is effectively grounded. The resistance R helps in limiting the follow current to a small value. The choke coil is so designed that it offers small reactance at normal power frequency but a very high reactance at transient frequency. Thus the choke does not allow the transients to enter the apparatus to be protected. The gap between the horns is so adjusted that normal supply voltage is not enough to cause an arc across the gap. Under normal conditions, the gap is non-conducting i.e. normal supply voltage is insufficient to initiate the arc between the gap. On the occurrence of an overvoltage, spark-over takes place across the small gap G. The heated air around the arc and the magnetic effect of the arc cause the arc to travel up the gap. The arc moves progressively into positions 1, 2 and 3. At some position of the arc (perhaps position 3), the distance may be too great for the voltage to maintain the arc. Consequently, the arc is extinguished. The excess charge on the line is thus, conducted through the arrester to the ground. The arc is self-clearing. Therefore, this type of arrester does not cause short-circuiting of the system after the surge is over as in the case of rod gap. Series resistance helps in limiting the follow current to a small value. The bridging of gap by some external agency (e.g. birds) can render the device useless. The setting of horn gap is likely to change due to corrosion or pitting. This adversely affects the performance of the arrester. The time of operation is comparatively long, say about 3 seconds. In view of the very short operating time of modern protective gear for feeders, this time is far long. Due to the above limitations, this type of arrester is not reliable and can only be used as a second line of defence like the rod gap arrester. 3. Multigap arrester: Fig. 24.11 shows the multigap attester. It consists of a series of metallic (generally alloy of zinc) cylinders insulated from one another and separated by small intervals of air gaps. The first cylinder (i.e. A) in the series is connected to the line and the other,to the ground through a series resistance. The series resistance limits the power arc. By the inclusion of series resistance, the degree of protection against travelling waves is reduced. In order to overcome this difficulty, some of the gaps (B to C in Fig. 24.11) are shunted by a resistance. Under normal conditions, the point B is at earth potential and the normal supply voltage is unable to break down the series gaps. On the occurrence of an overvoltage, the breakdown of series gaps A to B occurs. The heavy current after breakdown will choose the straight – through path to earth via the shunted gaps B and C, instead of the alternative path through the shunt resistance. When the surge is over, the arcs B to C go out and any power current following the surge is limited by the two resistances (shunt resistance and series resistance) which are now in series. The current is too small to maintain the arcs in the gaps A to B and normal conditions are restored. Such arresters can be employed where system voltage does not exceed 33 kV. 4. Expulsion type arrester: This type of arrester is also called ‘protector tube’ and is commonly used on system operating at voltages upto 33 kV. Fig. 24.12 (i) shows the essential parts of an expulsion type lightning attesters. It essentially consists of a rod gap AA’ in series with a second gap enclosed within the fibre tube. The gap in the fibre tube is formed by two electrodes. 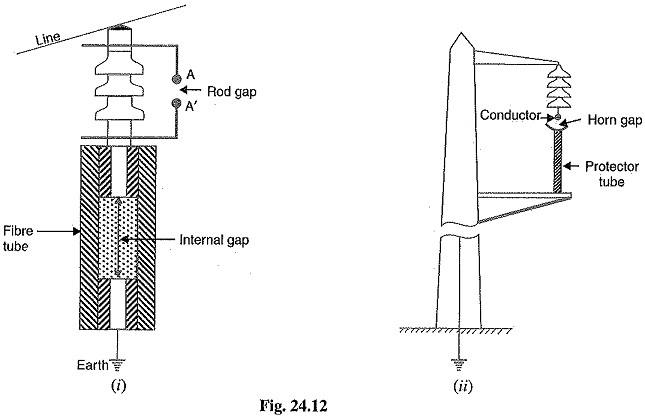 The upper electrode is connected to rod gap and the lower electrode to the earth. One expulsion arrester is placed tinder each line conductor. Fig. 24.12 (II) shows the installation of expulsion arrester on an overhead line. On the occurrence of an overvoltage on the line, the series gap AA’ is spanned and an arc is struck between the electrodes in the tube. The heat of the arc vaporises some of the fibre of tube walls, resulting in the production of a neutral gas. In an extremely short time, the gas builds up high pressure and is expelled through the lower electrode which is hollow. As the gas leaves the tube violently, it carries away ionised air around the arc. This de-ionising effect is generally so strong that arc goes out at a current zero and will not be re-established. They can be easily installed. An expulsion type arrester can perform only limited number of operations as during each operation some of the fibre material is used up. This type of arrester cannot be mounted in an enclosed equipment due to the discharge of gases during operation. Due to the poor volt/amp characteristic of the arrester, is not suitable for the protection of expensive equipment. 5. Valve type arrester: Valve type arresters incorporate non-linear resistors and are exten­sively used on systems operating at high voltages. Fig. 24.13 (i) shows the various parts of a valve type arrester. It consists of two assemblies (i) series spark gaps and (ii) non-linear resistor discs (made of material such as thyrite or metrosil) in series. (i) The spark gap is a multiple assembly consisting of a number of identical spark gaps in Each gap consists of two electrodes with a fixed gap spacing. The voltage distribution across the gaps is linearised by means of additional resistance elements (called grading resistors) across the gaps. The spacing of the series gaps is such that it will withstand the normal circuit voltage. However, an overvoltage will cause the gap to breakdown, causing the surge current to ground via the non-linear resistors. (ii) The non-linear resistor discs are made of an inorganic compound such as Thyrite or Metrosil. These discs are connected in series. The non-linear resistors have the property of offering a high resistance to current flow when normal system voltage is applied, but a low resis­tance to the flow of high-surge currents. In other words, the resistance of these non-linear elements decreases with the increase in current through them and vice-versa. Working: Under normal conditions, the normal system voltage is insufficient to cause the breakdown of air gap assembly. 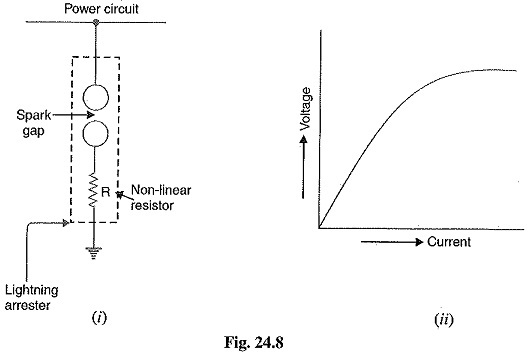 On the occurrence of an overvoltage, the breakdown of the series spark gap takes place and the surge current is conducted to earth via the non-linear resistors. Since the magnitude of surge current is very large, the non-linear elements will offer a very low resistance to the passage of surge. The result is that the surge will rapidly go to earth instead of being sent back over the line. When the surge is over, the non-linear resistors assume high resistance to stop the flow of current. They operate very rapidly taking less than a second. The impulse ratio is practically unity. They may fail to check the surges of very steep wave front from reaching the terminal This calls for additional steps to check steep-fronted waves. Their performance is adversely affected by the entry of moisture into the enclosure. This necessitates effective sealing of the enclosure at all times.